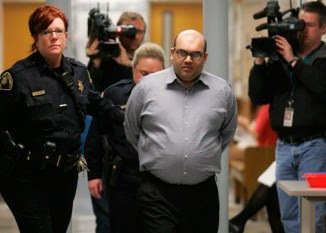 Jurors deliberated eight days on a verdict in the case of Naveed Haq, shown being led to the Seattle courtroom in April 2008, before a mistrial was declared. SEATTLE (JTA) -- A judge declared a mistrial in the case of the gunman who shot up the offices of this city's Jewish federation. The King County prosecutor vowed to retry Naveed Haq, 32, who claimed he was not guilty by reason of insanity. The jury said it could not agree on all but one of the 15 counts of murder and attempted murder against Haq, whose July 2006 shooting spree at the Jewish Federation of Greater Seattle left one woman dead and seriously injured five. Jurors deliberated for eight days after a six-week trial that featured testimony from 32 prosecution witnesses and 16 for the defense. Prosecutor Daniel Satterberg said he hopes to try the case again in six months. A hearing to select a new trial date is scheduled for June 12. In a news conference following the mistrial announcement, Satterberg told reporters that the mistrial would not seriously harm the prosecution’s core arguments and emphasized his continued commitment to the case. “The attack by Naveed Haq upon the women inside the offices of the Jewish federation remains one of the most serious crimes ever committed in this city,” Satterberg said. Haq kidnapped a 14-year-old girl to gain entrance into the building and began shooting as he reached the federation's second-floor reception area. He spewed anti-Israel and anti-Jewish slurs during the attack while decrying the Iraq war and Israel's 2006 conflict with Hezbollah in Lebanon. Haq made similar comments on a video shown in the courtroom prior to the trial's start. According to a court memorandum, Haq told a 911 operator during his shooting rampage, "I'm not upset at the people, I'm upset at your foreign policy. These are Jews. I’m tired of getting pushed around and our people getting pushed around by the situation in the Middle East." A self-proclaimed Muslim of Pakistani ancestry, Haq had driven 227 miles from his home in eastern Washington to Seattle, stopping to test-fire his two handguns along the way. Two weeks before the shooting he had researched Jewish organizations via the Internet to choose his target. He went on Mapquest for directions to the building. After the shooting, Haq was coaxed into speaking with 911 operators by a pregnant Dayna Klein, who covered her abdomen with her arm to protect her unborn child. The wound left her without use of the arm. Haq surrendered to police without further incident and complied with directions from police while in custody, officers testified in court. Federation CEO Richard Fruchter expressed disappointment at the jury’s inability to reach a verdict on all but one of the 15 counts against Haq. During deliberations, the six men and six women of the jury told the judge they did not understand the legal meaning of concepts like “right from wrong” and whether Haq knew the “nature and quality” of his acts. Prosecution witness Robert Wheeler defined the terms for the jury under direct questioning from prosecutor Donald Raz. Jurors made five requests to Kallas during their deliberations, but none were to clarify language or for a review of the 20-minute surveillance video from security cameras at the Jewish federation recorded the afternoon of the shooting. Haq initially was charged with nine felonies, including aggravated first-degree murder and five counts of attempted murder, all with the use of a firearm. Other charges included kidnapping and burglary for taking Kelsey Burkum hostage and unlawfully entering the federation building. Haq also was charged with malicious harassment under the state’s hate crimes law. Jurors found Haq not guilty on first-degree attempted murder for the shooting of Carol Goldman. The charge is expected to be lowered to second-degree attempted murder for the next trial. According to doctors who treated him for a decade, Haq suffers from Bipolar 1 disorder with psychotic features including schizoaffective disorder, delusions, hallucinations and depression. Once a promising student at the University of Pennsylvania--he has degrees in biology and electrical engineering – Haq became withdrawn and moody shortly after enrolling in graduate school, according to the medical experts. The defense’s central medical expert, Dr. James Missett, a Yale University-trained addiction and forensic psychiatrist, told the court that Haq was and is severely mentally ill, and was exhibiting manic and aggressive behaviors as well as deep depression on the day of the shootings. However, two counselors who evaluated Haq three days before the shootings testified that he was having no side effects from his medications and seemed to be feeling well. They said he was even looking for work. Haq was on six prescription drugs, including lithium, for his mental disorders. Defense attorneys had hoped to convince the jury that the combination was toxic and that a change in medications before the shootings had induced side effects that spurred his rampage. Two shooting victims, Goldman and Cheryl Stumbo, who were in court nearly every day voiced disappointment and shock at the verdict. Still, they said they would be back when the next trial starts.